This entry was posted in General on June 29, 2017 . On behalf of the Directors of the Sir Edward ‘Weary’ Dunlop Medical Research Foundation I have pleasure in presenting this annual report to the members of the Foundation and to our interested stakeholders. This entry was posted in General on December 5, 2016 . The Symposium presents an opportunity for Dunlop supporters to hear from researchers whose work has been supported by the Foundation, and to learn how it is making a difference! All are welcome to come along. Lunch will be provided at the conclusion of the session. This entry was posted in General on August 17, 2016 . A very special Weary Dunlop commemorative service was held on the anniversary of Sir Edward’s birth, 12 July, at his statue in St Kilda Road, Melbourne. 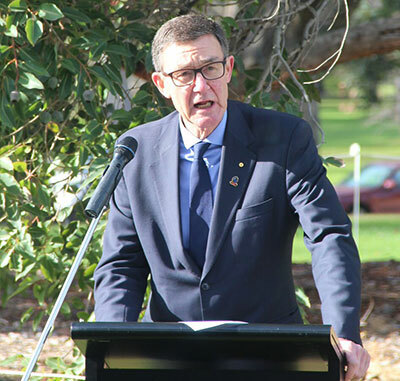 The large number attending in brilliant sunshine heard a wonderful address from special guest Sir Angus Houston. Hon Kelly O’Dwyer MP launched the Foundation’s Annual Fundraising Appeal. Other highlights included the awarding of the Swinburne Weary Dunlop scholarship to Mr Dylan Kerr by Deputy Vice-Chancellor (Academic) Professor Duncan Bentley, and a special presentation by State Minister for Veterans, Hon John Eren, to our long time leading Appeal collector, Mr Alan Jennings. The service was enhanced by the presence of former Prisoner of War Colin Hamley and other representatives of the Ex-POW community, the Dunlop family, students from several secondary colleges, and of course the music of the Royal Australian Navy Band Melbourne. 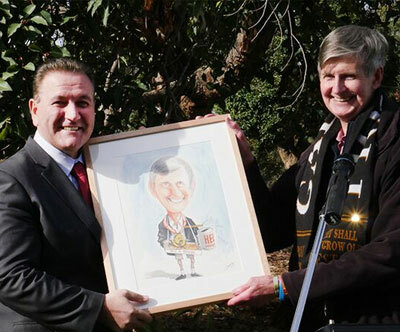 The Hon John Eren presenting to Mr Alan Jennings. Air Chief Marshal Sir Angus Houston AK AFC (Ret’d). 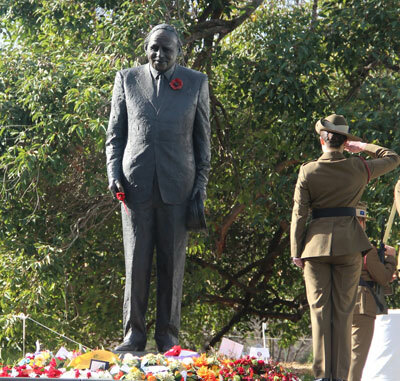 A soldier salutes the famous statue. This entry was posted in General on June 10, 2016 . The 2018 Australia Day Honours announcements brought the marvellous news that our colleague Director, Major General Professor Jeffrey Rosenfeld AM OBE, had been awarded a Companion in the Oder of Australia (AC). The citation reads – “For eminent service to medicine, particularly to the discipline of neurosurgery, as an academic and clinician, to medical research and professional organisations, and to the health and welfare of current and former defence force members” – wonderful recognition of Professor Rosenfeld’s outstanding contribution. Congratulations to Dr Elif Ekinci, our Dunlop Research Fellow and Board Director, who was promoted to Associate Professor in December 2017. As well as recognising the value of her work, this follows a number of personal honours including addition to the Portrait Gallery of notable alumni of Mac. Robertson Girls’ High School, for her fine professional achievements and contribution to the wider community, and the 2015 Early Career Clinician Researcher Award – Medical Category from the Victorian Clinician Researcher Network from Biomedical Research Victoria. Carl Schiller OAM CSM, has recently been appointed national president of the Air Force Association – well done Carl. The Board was pleased to learn of the award of a Medal in the Order of Australia (OAM) to our Chair, Mike O’Meara, in the June Queen’s Birthday Honours list. The award is in recognition of Mike’s service to Veterans and their families and to the community of Kilsyth. In June 2016, Mike’s work was recognised by the Rotary Club of Montrose and District with their Kevin Heinze Community Award for service to the community over many years, “particularly local youth and adult community sport in the Kilsyth area, community involvement, as well as the support of local Veterans’ groups and individuals. In December 2015, the Department of Veterans’ Affairs Victoria awarded Vice Chairman Michael Fidler a Certificate of Appreciation for his service to Veterans through the RSL, Dunlop Foundation, and as a member of the Story Writing and Art Competition committee. Our senior and longest standing Board member, Fred Cullen, was recognised with a special award by Melbourne Legacy for over 50 years of collecting for the Legacy Fundraising Appeal. In October 2015, the “significant voluntary services to the local community” of Secretary Ray Gill were recognised with the awarding of the Caroline Chisholm Award 2015 by Anna Burke MP, Federal Member for Chisholm. Our congratulations to all – well done! This entry was posted in General on June 3, 2016 . Thursday 12 July Weary Dunlop Annual Service & Appeal Launch, at Weary’s statue, in Shrine precinct, St Kilda Road, Melbourne. 10:30am for 11:00am start. This entry was posted in General on February 11, 2016 . Primary Schools at Year 6 – Australian Curriculum: history – What contribution have significant individuals and groups made to the development of Australian society? Secondary schools (history, civics and citizenship, English – creating biography) as a case study providing a short evidence-based approach to help students understand the significant contribution of Weary Dunlop to the Australian prisoners-of-war on the Burma-Thai Railway, and afterwards. It takes students through a variety of evidence, and provides a model that can be used to investigate other significant people in twentieth century Australian history. This entry was posted in General on October 12, 2015 . Thirty Years Supporting Veterans’ Medical Research! The Sir Edward ‘Weary’ Dunlop Medical Research Foundation conducts an annual Weary Dunlop Appeal, providing an opportunity for Australians to give generously to help Australian medical research; a chance to perpetuate the selfless and steadfast spirit of the Foundation’s inaugural patron, Sir Edward ‘Weary’ Dunlop. Its launch throughout Victoria coincides with the Commemorative Service on 12 July, at Weary’s statue on St. Kilda Road, and runs for two weeks. The service is attended by patrons, political and academic dignitaries and also representatives of the Australian Defence Forces, the RSL network and other service organisations. During the two weeks of the appeal, we seek generous donations from the public of Victoria, the ex-service community such as RSL sub-branches and other ex-service organisations, and schools and community groups. You can help us to help others by making a different kind of donation – your time and effort. We are seeking volunteers to help before and during the two-week campaign by selling Weary Dunlop lapel pins, by assisting us with administrative and logistical support and/or by displaying posters and printed materials in the community in order to raise awareness and understanding of the Foundation and the appeal. If you are interested in volunteering for the Weary Dunlop Annual Appeal, please fill out and submit the form here and we will contact you with further information. d) Displaying posters and printed material within your community. This entry was posted in General on February 10, 2015 .